Saturday 13th April 2.00 - 4.00pm Children’s Easter Craft Workshop Free, drop in workshop. Children have to be accompanied by an adult. Includes a procession with palm crosses accompanied by band. A beautiful, reflective and brief service of Night Prayer (Compline) in the Chapel. As we remember the Last Supper we will enjoy a meal together as a church family. It will include a Seder (Passover) meal. Please book in advance using the sign up sheet at the back of church. Donations invited towards the cost. All ages welcome. Readings, prayers, music and silence in the candlelit Lady Chapel to remember Jesus’ final evening in the Garden of Gethsemane. 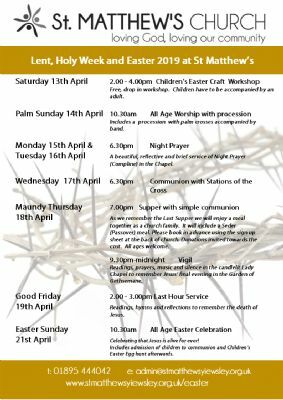 19th April Readings, hymns and reflections to remember the death of Jesus. 21st April Celebrating that Jesus is alive for ever! Includes admission of children to communion and Children’s Easter Egg hunt afterwards.